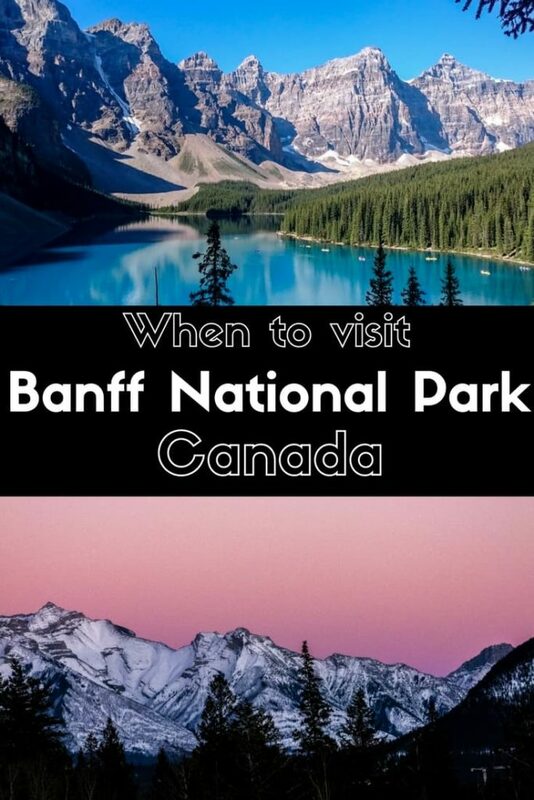 Are you planning a trip to Banff? Do you want to know when is the best time to visit Banff National Park, one of the most popular places in Canada? It’s understandable that choosing your travel date is not an easy task. Worry no more. This is exactly what you need to read. 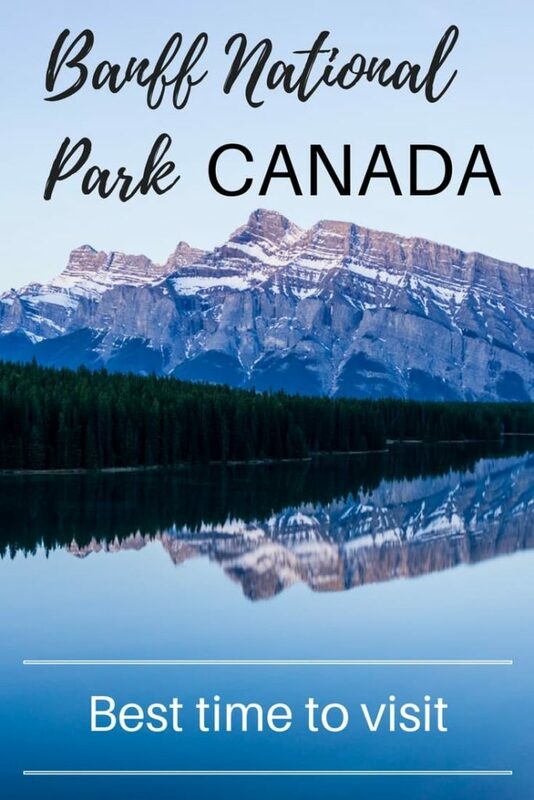 Read till the end where we recommend when is the best time to visit Banff (or any other national park in the Canadian Rockies) from our experience. When do people visit Banff? 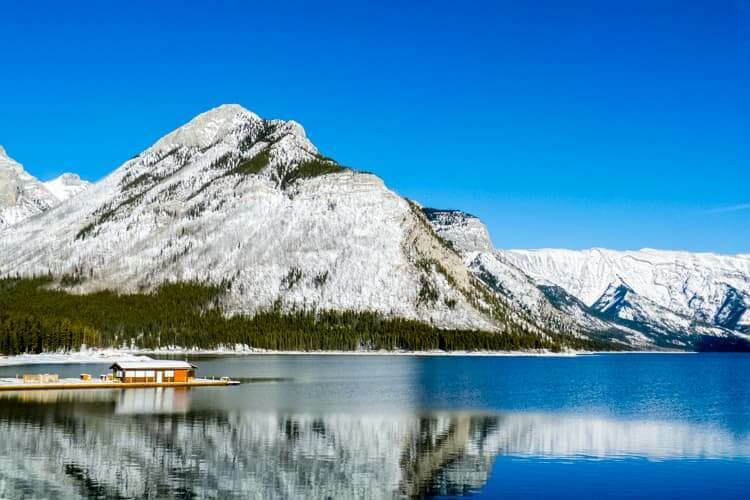 The Canadian Rockies consists of 5 national parks – Banff, Jasper, Yoho, Kootenay, and Waterton. With the exception of the smallest national park Waterton, the other 4 are all neighbours and therefore the seasonal breakdown in this article applies to all national parks. We’ve lived in Banff for a brief time when we moved to Canada and the Canadian Rockies have been our playground for more than 4 years. Therefore we understand it might be frustrating trying to find out when to visit and what to expect. There are 4 seasons but for visitors, I’d say there are 2: busy season and shoulder season. Busy season is at the peak of summer and peak of winter. Shoulder season is May-June and September- November. You can visit Banff any time of the year and will have plenty of activities to choose from. Even though summer is the most gorgeous, it is also crazy busy and unbelievably expensive. That’s why this article details all the seasons and activities, so you can choose the best time to visit that suits you. Ask anybody in the world about the weather in Canada and the first answer you will get: Canada is cold. That is not really an accurate answer. Canada is a huge country and some parts are much colder that other. 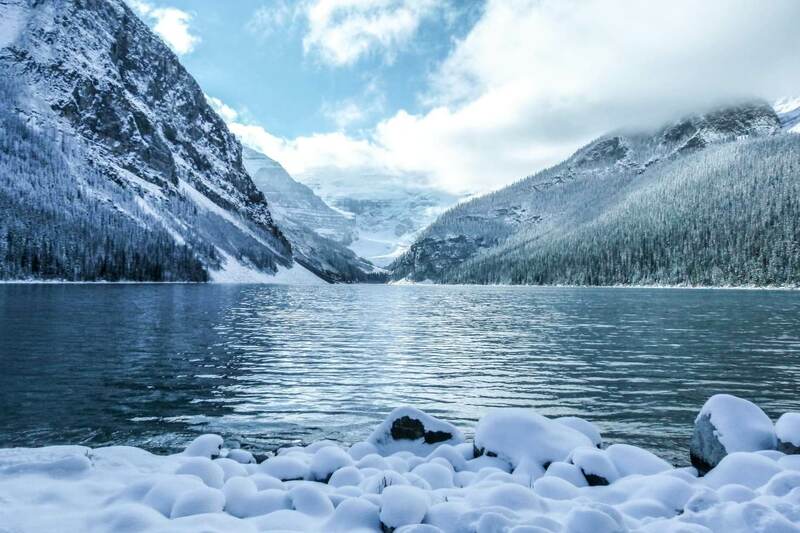 The Canadian Rockies have longer winter than you would think but summers are also quite hot and can reach +35C temperatures. You can also have -15C in the morning and +15C in the afternoon on the same day! To find out when is the best time to visit Banff, let’s find out more about seasons in the Canadian Rockies. When you are high in the mountains, weather and conditions can change significantly within a short period of time. You can have snow in July but also + 15°C in January thanks to Chinook wind which affects southern Canadian Rockies. Leonardo DiCaprio mistakenly thought the warm wind in the winter is a consequence of global warming when he was filming the Revenant in the Rockies. Note: all of the below periods are long-term average and each year can be different by as much as 30 days. See temperature charts for monthly temperature averages. Winter in Banff usually starts around November 15 when the first solid freeze period comes and snow starts to stick to the ground (even though it can snow in September already but won’t last long). Ski resorts start to open. At the end of November, Lake Louise ski resort hosts World Cup in skiing. November and December is the period when lakes start to freeze and therefore you might have options for skating on lakes (see below section Skiing & Ice skating). With ideal weather conditions when is really cold (-20°C) for a short period of time and doesn’t snow you may have clear ice for skating or pond hockey, a favourite activity of Canadians. At the end of December pretty much every bit of land in the park is covered with snow. 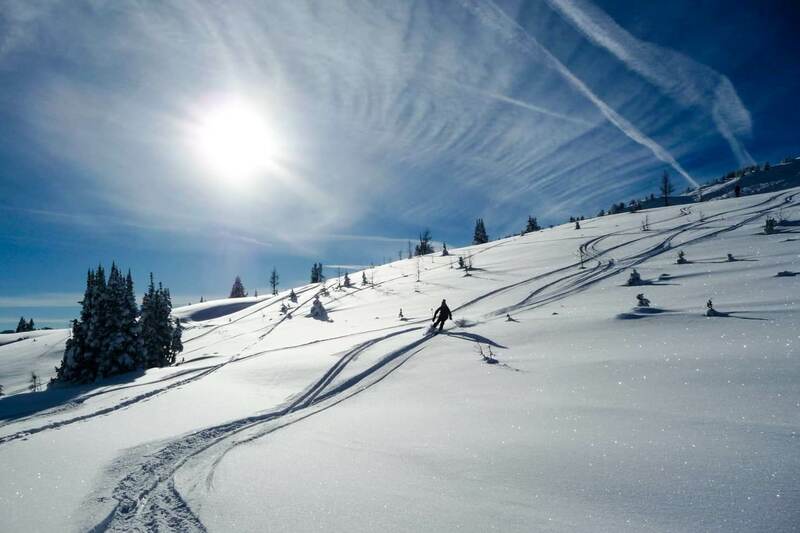 January and February have the best conditions for skiing, cross-country skiing and snowshoeing. 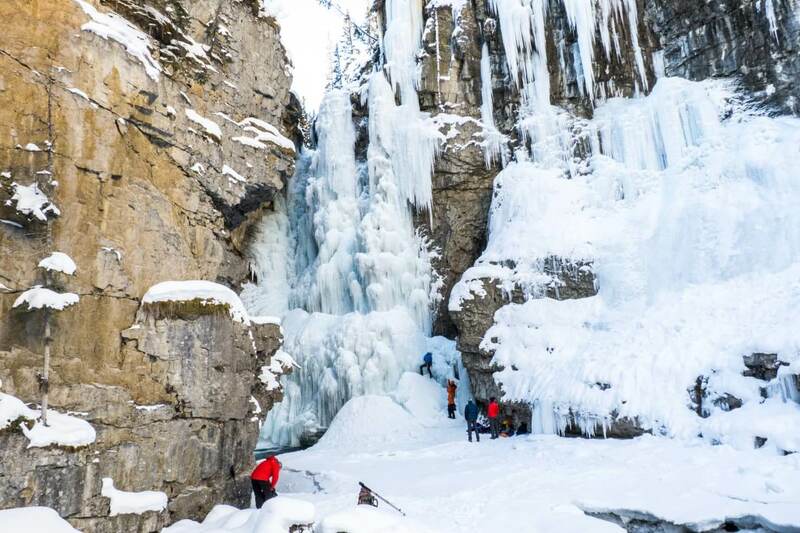 This time of the year Banff usually gets two streaks of cold weather lasting about a week to 10 days, when the highest temperature drops to -25°C or less, which is great for ice climbing. 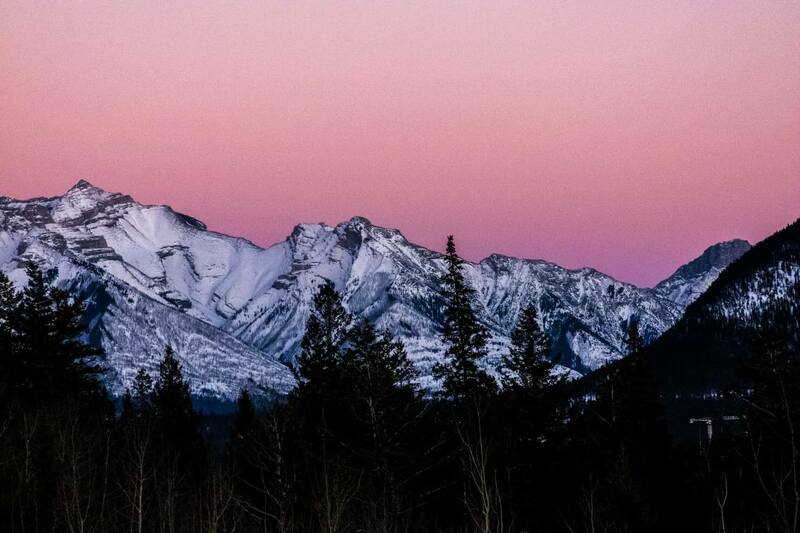 One of the reasons for cold weather in the Rockies is that days are quite short with only 9 hours of daylight. March is the best time to go skiing in Banff National Park. Days are longer and temperatures are getting above freezing during the day. It’s also a really good time for dogsledding or fat biking. April is the last month of the winter season to do some proper skiing around Banff. Days are warm and many areas are missing a bit of snow. Rivers are not frozen anymore. Banff in April and first half of May is the time when ski resorts close down and you won’t see any snow in towns. You will already have options for shorter hikes in valleys or hikes which don’t reach higher peaks but they will most likely be quite wet. There’s usually an avalanche danger announced during this time so make sure to check trail conditions before you go. In April there is a chance you will see bears on slopes waking up from hibernation. As I mentioned earlier, spring in Banff National Park starts a little later than you would normally expect but it has everything that spring should have. Green meadows covered with flowers and bears feasting on them, great smell of pine trees, warm afternoons. And also the time when animals have their offspring born and teach them the first lessons of life. Banff in May starts getting busier when Canadians head to the mountains after a long winter and tourists start visiting for hiking season. 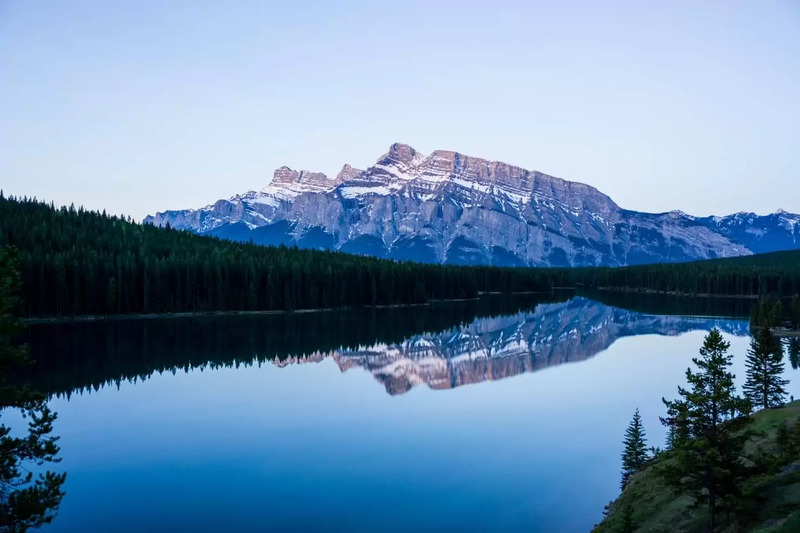 Victoria Day at the end of May (May 20 in 2019) is called May long weekend – it’s the busiest time in Banff when campgrounds, roads, and trails are opening and the town is full and very crowded, usually by visiting Calgarians. Almost every summer activity is possible to do during this time. The famous Moraine Lake and Lake Louise start to slowly thaw. By June, there is no more ice in Banff National Park, but trails can still be quite muddy. On the other hand, crowds start to fill up the streets and you will need to wait in lines, especially during weekends. During summer time you have plenty of daylight. In June, there are more than 16 hours of daylight and you can do anything, especially hiking and biking is very popular. Check out our list of 20 best hikes in Banff. June and July get most rainfall and a lot of thunderstorms occurs with some heavy rainfall. Banff in June and July is very hot, temperatures in the valley can easily surpass 25 or 30°C. Best weather in Banff National Park is in August as fewer thunderstorms occur and weather conditions are stable. Summer holidays and warm weather bring tourist masses to the park. Canada Day (July 1st), Heritage Day in Alberta and Labour Day are holidays when most people come to Banff National Park. I doubt you want to be there at this time. Hotels are sold out, crowds everywhere, traffic is collapsing, parking lots are full, and restaurants are full. Please don’t make a mistake and check these holidays before you visit Banff. Other days are pretty busy also, and the weather is favorable for plenty of water activities such as kayaking, paddle boarding, rafting or even swimming in the lakes. From September as the school year starts, the park will become quite empty compared to summer months. The first half of the fall can have really great weather but it’s also the time for first snowfall in Banff. That doesn’t mean it will stay. Banff in September is still warm and enjoyable for most outdoor activities, although mountain peaks might be snow covered already. This time of year is great to see wildlife in the lower valleys and towns as they slowly start to come down from upper meadows to stay in warmer parts of the park during winter. Nights are getting longer but the temperatures are still good for camping. The second half of the fall significantly changes the weather with snowfall occurring more often and freezing mornings with chilly and windy afternoons. From October, Parks Canada closes some roads to important places such as Moraine Lake or Spiral Tunnel parking lot (outside Banff National Park) and also many campgrounds. Many areas are in a transition period while it is cold but not cold enough for winter activities. End of October is also the time when Banff Mountain Film Festival is held. Banff National Park is one of the most visited places in Canada. There are only about 10,000 people living in the park. To compare, Banff visits on average about 11,000 tourists a day. With more than 25,000 people during August weekends and only about 1,000 tourists a day during November weekdays. This shows why we do not recommend visiting in the summer. If you’re interested, read actual stats when people visit Banff National Park. Our advice for visiting Banff is avoiding weekends and staying as many weekdays as possible. Most importantly try to avoid long weekends (see a calendar of Canadian Holidays) as even more people visit from close by Calgary. Not sure how to get to Banff or don’t like to drive? 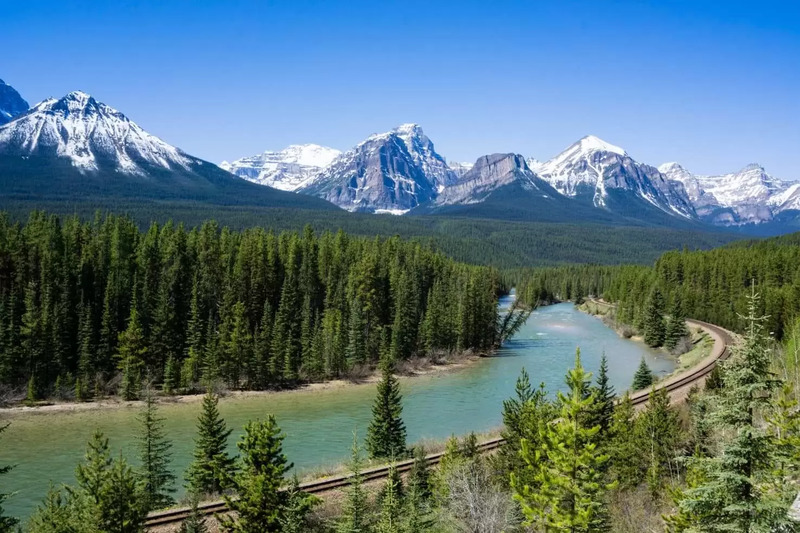 Read our post about different options how you can get from Calgary to Banff. Nowadays the vast majority of visitors get to the park by car. There are two main directions, either from Calgary or Vancouver. Smaller amounts of tourist visit from Jasper or come from the US directly via road 93 and Kootenay National Park. If driving from Calgary, take Trans-Canada Highway westward and you will reach National Park in about an hour of driving (110 km). From Vancouver, it takes longer, about 10 hours of driving as it is 900 km away. Canadian National Parks are very well maintained, and entry fees play a big part in that effort. You will have to buy a day pass or annual pass upon entry in Banff National Park. Coming from Calgary you will cross booths at the beginning of the park on the highway. Other entrances don’t have toll booths and you will have to buy a pass at visitor’s centers. Find out more about prices and passes. Banff is a small town with a good public transport network which gets you everywhere in town (and also to Canmore). It is reasonably priced and we recommend it to use during the high season. Roads within Banff National Park are well maintained and even during winter are drivable. You can expect some closures after big snow storms when maintenance crews have to plow big amounts of snow. Some roads also have seasonal closures to either protect the wildlife or tourists. See which closure may affect your plans. During high season car rental companies increase prices. Try renting a car from locals through Turo. It’s like Airbnb but for cars with very affordable options. If you sign up through this link you will get a $25 discount on your first rental. Services in Banff and Lake Louise are very expensive. Visiting Banff outside the main season pays off. 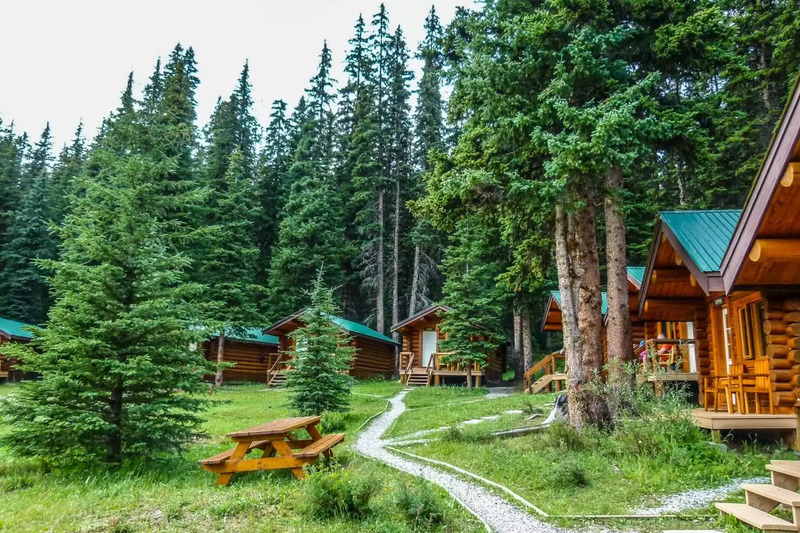 Prices for accommodation in Banff and Lake Louise during summer months can be as much as triple the price compared to shoulder season. And that is definitely a lot. When visiting Banff National Park, consider staying in nearby town Canmore which is just outside of the park limits. Best prices on accommodation and car rental are in April-May and September-November. Average hotel room price in Banff is about CAD 300 per night. Did you know you can rent a campervan for less than half the price of the hotels in Banff? Rent our Smile Campervan and stay connected with true Canadian wilderness. Attractions in Banff National Park have stable (high) prices throughout the year. Some may have seasonal closures, for example, boat rides are not possible on frozen lakes (obviously) or Banff gondola doesn’t operate for a couple of weeks in January. If you are planning to visit attractions, definitely avoid them during weekends and holidays as endless waiting in lines (2-4 hours on gondola) will ruin your trip. Hiking is the most popular outdoor activity in Banff National Park. 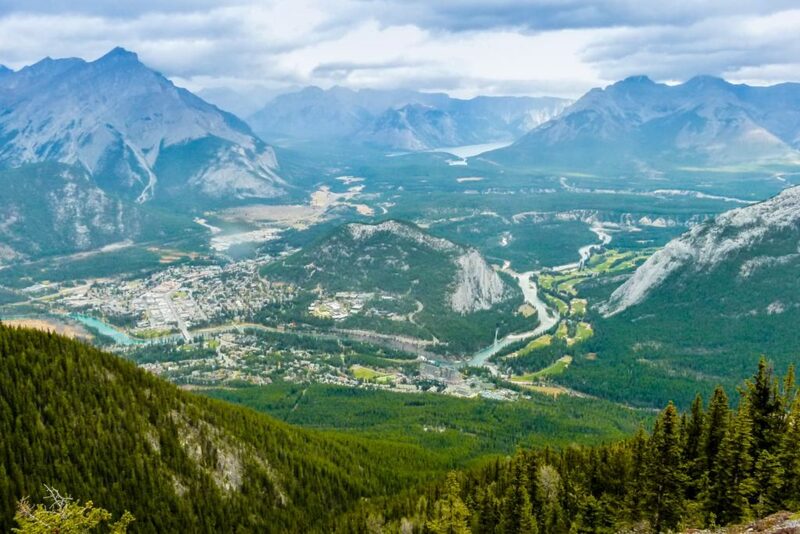 Best time to visit Banff for hiking is between June and end of October. Where in June you might still have some trails covered with snow and mud. October is last month for summer hiking and with snowshoes, it’s a year-round activity. A great example is Johnston Canyon where hikers come all year long – for summer waterfall walk to colourful Ink Pots or ice walk in winter. 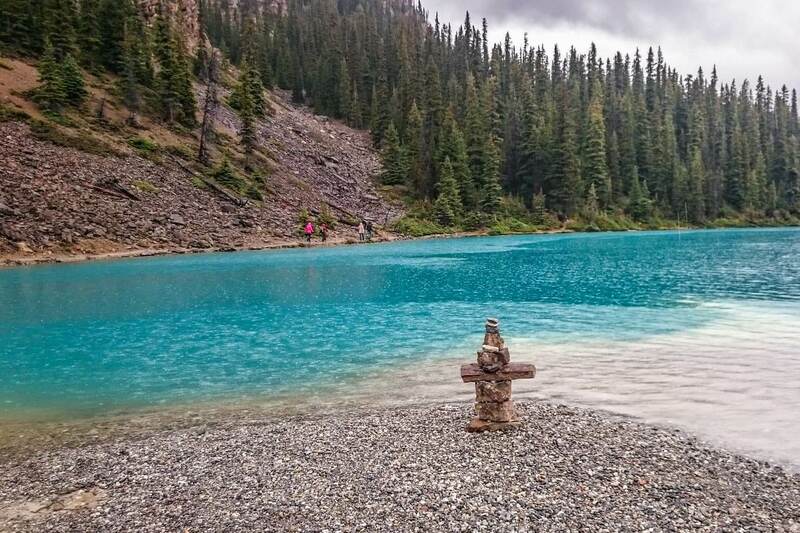 These are 20 hikes we recommend in the Banff area. 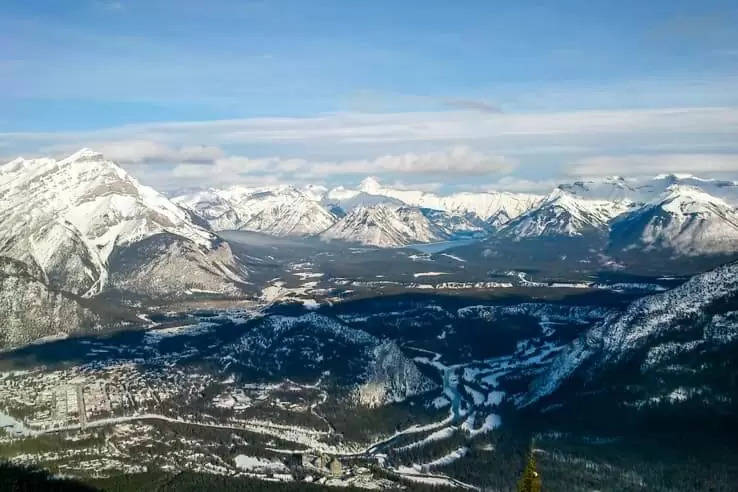 Another great year-round hike is up to the Sulphur Mountain, read our comparison Sulphur Mountain Hike vs. Banff gondola ride. Downhill skiing and cross-country skiing are other popular activities in Banff. Park has three ski resorts Lake Louise, Sunshine Village, and Mt. Norquay. Best skiing conditions are from December up to March. Outside of this period and during warmer winters you will have either not enough snow or icy conditions on the slopes. In November or beginning of December, the lakes start to freeze and might be thick enough for ice skating. Being surrounded by mountain peaks and skate endlessly and freely on the lakes is a fabulous way to experience the Rockies in winter. 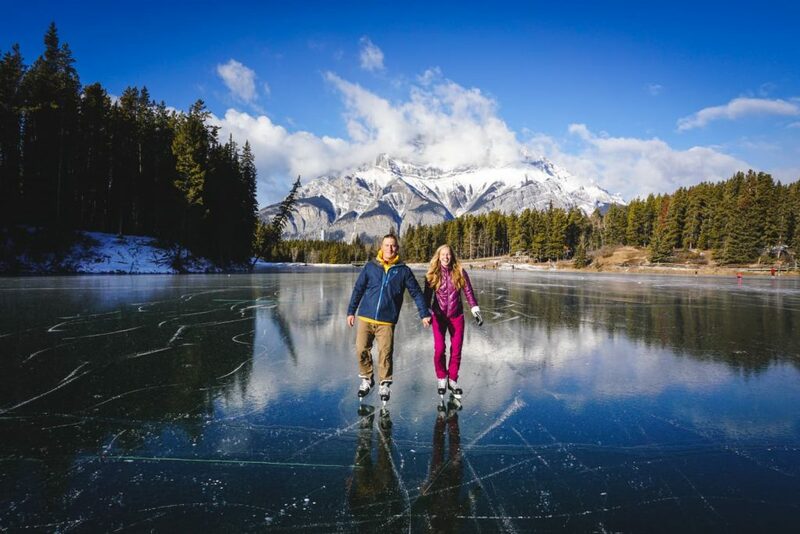 Read our post with tips and best places to go for ice skating in Banff. March is the best time to ski in Banff as days are longer and temperatures are around zero. Early bird ski passes in November are usually half price. Cross-country skiing is a cheaper alternative and doesn’t require paying for ski passes. 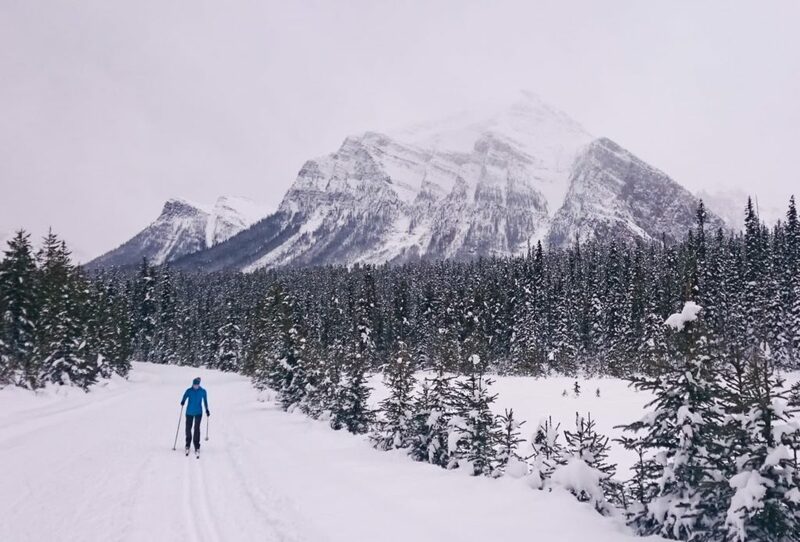 Read our post about cross-country ski trails in Banff. Banff and the Canadian Rockies offer conditions for mountain biking from the end of May to beginning of October. Outside of this time frame, you won’t have many options to bike within the park unless you bike on the roads. Most of the mountain biking trails are at the bottom of valleys but many great biking trails are just outside of Banff National Park border in Canmore and Kananaskis country. 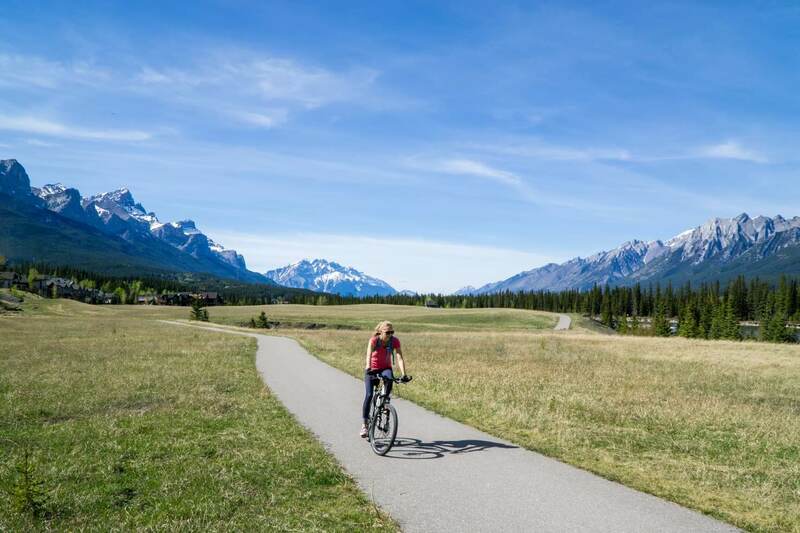 Read our post about Biking trails in Banff. Camping in Banff is mostly summer activity. Trailer campgrounds are usually open from the second or third weekend of May. The park is well equipped with campsites and during summer months we strongly suggest to book in advance as campsites fill up quickly. Best time to visit Banff National Park for a summer road trip is from May to October. Otherwise, most of the campsites are closed. If you are planning to stay in hotels or do only day trips come to Banff anytime. Every season has something to offer. 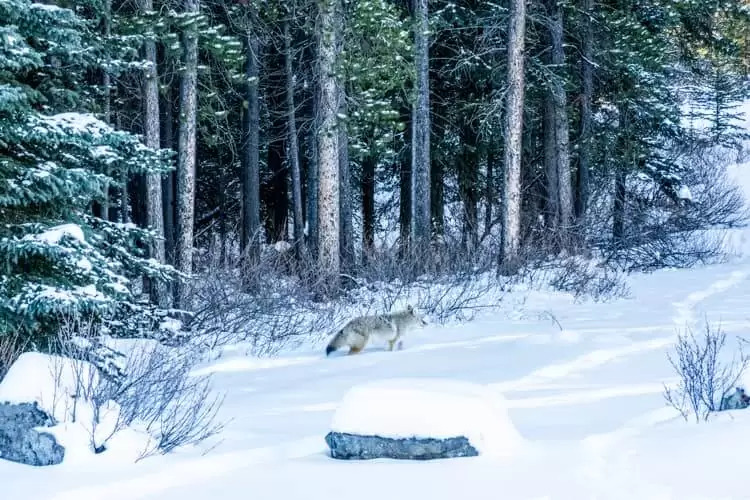 Banff is one of the best places to see many types of wildlife in the shortest amount of time. Animals live in a protective environment and mostly used to human presence. It is really easy to spot elk, bear or mountain goats. As Parks Canada reintroduced bison, the wildlife watching opportunities will increase in upcoming years. You can read our post Wildlife in Canada. You can see wildlife all year round. In winter many animals such as elks, goats, and sheep can be seen along the road licking salt. Baby animals are born in spring. Bear season is from April to November and wolves can be seen all year round although harder to spot. To increase your chances to see wildlife, go hiking further from town. Best time of the day is right after sunrise or before sunset. Most encounters happen during these times of the day. 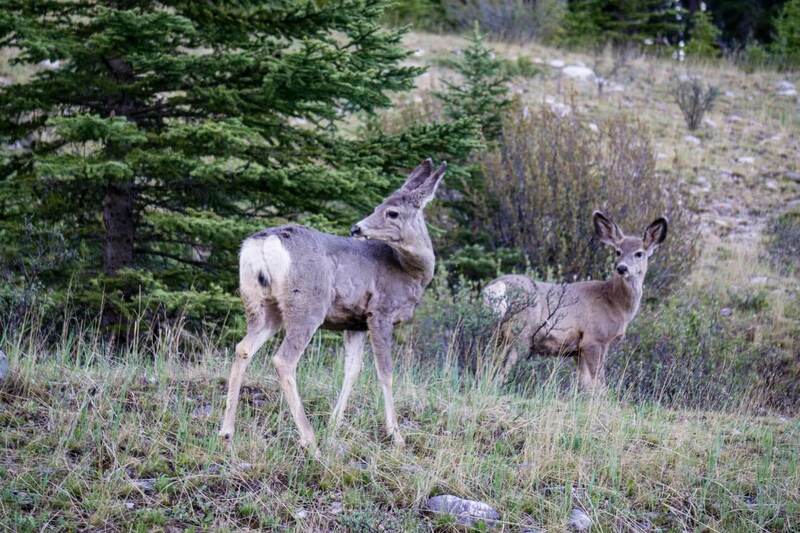 Drive through Bow Valley Parkway or Icefields Parkway and you will see plenty of wildlife from the car as well. Same rules apply for making pictures in Banff as for seeing wildlife. Any time of the year is good depends on what you want to take pictures of. Winter photography is great between December and April when many waterfalls are frozen and mountain peaks covered in snow. 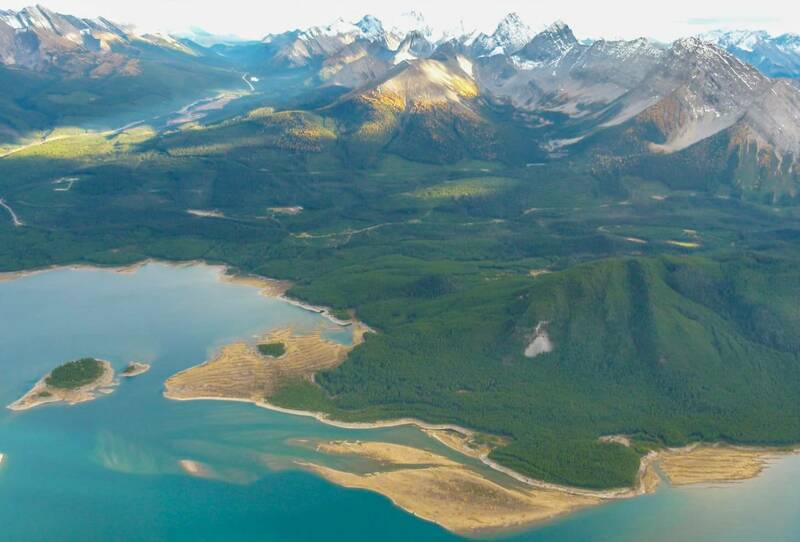 Lakes, including famous Lake Louise, Moraine Lake, and Peyto Lake, thaw in June. You shouldn’t expect to see them blue before that. When you want to take photos of Northern Lights/Aurora Borealis, winter is generally the best time as nights are longer and skies dark. Be prepared for very cold weather but the reward will be worth it. You have to check space weather as Aurora is not commonly seen in Banff National Park but we’ve seen it a lot of times just outside of Calgary. Generally speaking, you might be able to see Northern Lights all year round if all conditions line up. 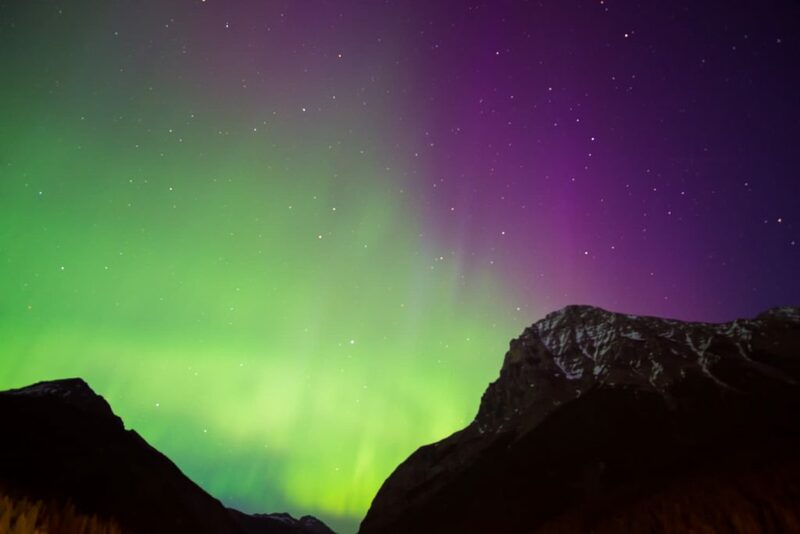 The most beautiful northern lights we’ve ever seen were in May in Yoho National Park. The absolute best time to visit Banff National Park and the Canadian Rocky Mountains is the end of June or September. As you can see, the best time to visit Banff is always depending on your preferences. 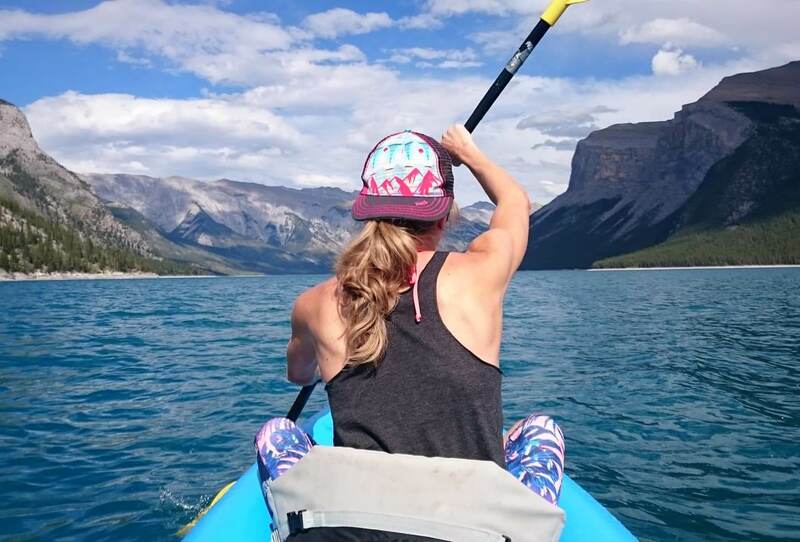 We spend almost every other weekend in Banff area and our favourite times are June or September when you will get the best value, the weather is still warm and most importantly you won’t feel like in a crowded shopping center. Let us know when you would like to visit and what would you like to see in the comments below. I’m from England and looking to come to Banff next October (end of October) with my son. My plan to is get a shuttle from Calgary airport to Banff and then spend 7 nights in Banff. I wonder if you can advise me in terms of getting around at that time of year. I understand from your website that Roam and Hoponbanff shuttle buses run up until end of September/beginning of October but I can’t seem to find what options there are for the end of the month. 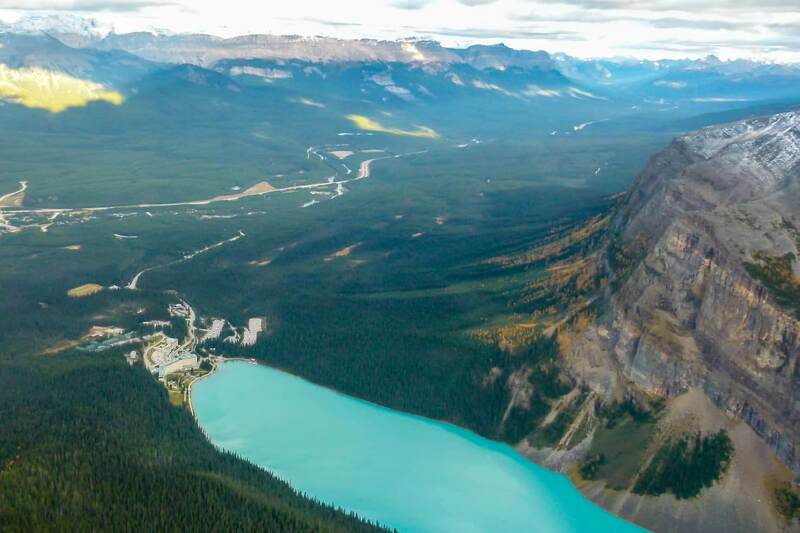 I can find some day tours to see Peyto Lake and the Skywalk etc but I’d also like to see Johnston’s Canyon, Lake Louise, Lake Moraine, and Banff Gondola etc. Are you able to advise on public transport options for these? Or is my best option at that time of year to hire a car? I’d be open to doing this, however my only worry are the driving conditions with snow starting to fall as I’m on my own with a child. Any help you can give me would be hugely appreciated! there’s now a new connection to Lake Louise that also runs in autumn (including end of October). And regular public bus in Banff runs to Gondola year round. However, to see Johnston Canyon, you would need a car at the end of October (shuttle only runs until October 8th). And road to Moraine Lake is usually already closed at that time of the year (it’s been for 2 weeks now). I would suggest renting a car if you want to see all those places without a day tour (or come in the beginning of October). So far the driving conditions have been very good and dry but of course, nobody knows how it will look next year around this time. My partner & I are doing a round trip from Vancouver to Banff and back from May 1st-May 18th. I am concerned some roads will be non-accessible and we may not be able to see all the amazing lakes/rivers Banff and Yoho have to offer. Could you give any advice for this travel period? Or if you have any experiences travelling in this time that would be great. I’m afraid that the beginning of May is not the best time for a visit if you want to see the lakes. The road to Moraine Lake usually opens in late May and the lake is still partially covered by ice. Lake Louise is accessible all year round but will most likely be partially covered by ice as well in the beginning of May. 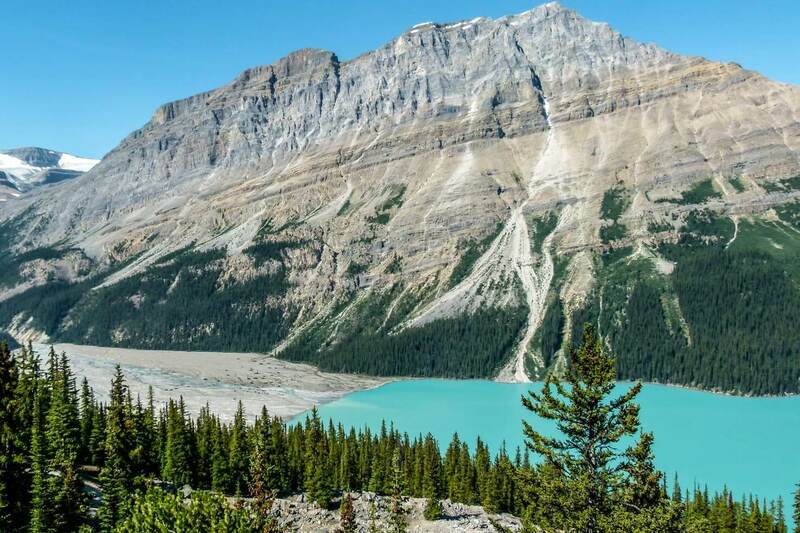 Access to Peyto Lake will be closed in 2019 due to construction but exact dates haven’t been announced yet. In Yoho, the road to Takakkaw Falls is closed until June. What you can see when you come is Lake Minnewanka, Johnston Canyon, Lake Louise, Bow Lake in Banff; Emerald Lake and Natural bridge in Yoho. I want to visit Banf and Lake Louise when the water is a nice blue and the mountains still have some snow whether a lot or some little. Which months are best to come visit? The best time would be September, and maybe even beginning of October.